Last year, after the Jets' wild-card-round victory over the Cincinnati Bengals, we compiled the ten greatest teams in Jets history, starting with the premise that "no matter how good a team was in the regular season, if they lost in the first round of the playoffs, they fall behind a lesser Jets team that didn't." Using that premise — which we think a sound one, considering playoff success is the only success that ultimately matters — Rex Ryan has presided over two of the four best Jets teams in history. In two years. We think that's his greatest achievement: He's turned the Jets into bad guys, rather than sad sacks. When we did that slideshow last year, we sorted through one painful moment in Jets history after another. The monsoon in 1982. The short-lived ten-point lead over John Elway and the Broncos in the 1999 AFC Championship game. Mark Gastineau's roughing the passer penalty on Bernie Kosar in 1987. The Doug Brien game. These are scars on the Jets fan psyche, a franchise that has often been lost in the Giants' shadow, a provider of pain, a little slice of Cleveland right there in the tri-state area. Every team in this town has won a championship since the Jets have won one. The Jets have rarely felt all that close. And here it is: Before Ryan arrived last year, the Jets had won two playoff games in the last ten years. In his two years, they have won four. As we reflect on the Jets' cleansing, season-salvaging victory over the Patriots yesterday, it is worth remembering how far Ryan and Mark Sanchez have taken the Jets. There have been some unlikable Jets teams in the past — unlikable for the opponent's fans, not Jets' fans — but never to the extent that this Jets team has been unlikable. We read a lot of "I hope a meteor strikes the stadium so both teams are taken out" jokes yesterday, and that's rarefied air, really. The Jets — the Jets, people! — have been the most relevant, most famous, most infamous team in the NFL all year. 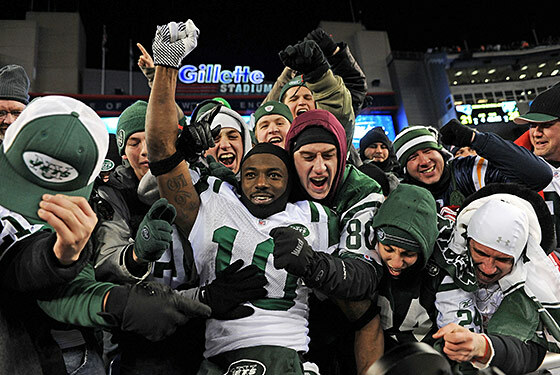 Everyone has an opinion on the Jets, after years when they've been rather easily ignored. And now they're at the center of the NFL discourse, and, oh yeah, while all that's been happening, they've made it to two consecutive AFC Championship Games. Everything went right for the Jets yesterday, and it went right by design. Ryan pulled out every stop — defensive lineman Trevor Pryce said, "The game plan was out of sight. It had everything. We did some stuff I've never seen a pro football coach do. Ever. And that was Rex. It was the craziest thing. I don't know how we did it, but we made one thing look like this, and another thing look like that. When you can confuse a Hall of Fame quarterback, you know your game plan is working" — to the point that we keep imagining Rocky-esque training montages of Ryan eating pizza, watching game film, and scribbling furiously in a notebook. It was a master class in coaching. It'll be on his tombstone. The Jets have one more win to go, and it's a mountain Ryan has never cleared, one the Jets haven't cleared in 42 years. If the Jets don't beat the Steelers on Sunday, this game will only be remembered, rather than bronzed. But if a coach can get his team to pull off what it did against the Patriots yesterday, you have to think they're capable of anything. These are the Jets today, as we know them, so different than they've ever been known before. Fans, coaches, and media talk so often about a "culture of losing," like in Detroit, Arizona, Cincinnati. The Jets have felt like that before. No longer. The Jets have one more step to go, and then Rex Ryan will have renovated and reinvigorated this franchise in the way no one has before. It's really something to see.